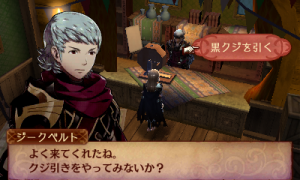 At the Lottery Shop, you can receive a random weapon or item free of charge. The Lottery Shop reopens for business at the start of each morning. In practical terms, you can visit it once every four battles or four 6-hour periods (or a combination of the two). In the Birthright campaign, you can play the “Dawn Lottery”; meanwhile, in Conquest, you can play the “Dusk Lottery”. Or if you’re in Revelation, both options will be available. The items you can obtain obviously depend on the lottery you’re playing, but also the prize ball that comes out. The higher the Lottery Shop Level, the better the chances of acquiring rare items. Note: The tables below may be slightly inaccurate.